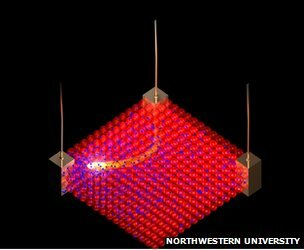 BBC technology reported about an exciting development in the world of computing and chips at Northwestern University. It points to a future technology that could be truly astounding and enable computing devices to be even smaller, cheaper and more powerful than the immediate direction we are heading in with silicone-based chips that are being developed now. They are developing this future by addressing known scientific theory and molding it an entirely new way. With their direction, there are also lessons to be learned by companies of all types. The researchers have developed a material that manipulates positive and negative particles to form a dynamic transistor that switches by external electrical pulses – effectively re-wiring itself. It is challenging to understand even when reading the report, but the presumed possibilities are seemingly endless and extremely exciting. Please read the article via the link above to get more of the technical story than is being portrayed here. Other than that cool future, there is a great lesson for all businesses in the here and now. One of the researchers, David Walker discussed how they came to this solution for the key challenge of creating chips that are even smaller and more powerful – especially when there is not much room to get smaller. “It’s becoming more and more challenging to make devices smaller and you need to think of new ways rather than just shrinking things down because you’re reaching a fundamental scientific limit here of how small you can make a device,” said Walker. And therein lies the key learning. Far too often, we see companies reduce department head counts and still ask them to do everything they were doing – and more. By effectively following the thought process and re-evaluating what they are doing, they can not only be more efficient but also perhaps lead to growth for the company. This certainly doesn’t mean disbanding a unit or starting a whole new group – there is opportunity to evaluate the existing resources and structure to see if reconfiguration can wield enough of a difference. The particles that the Northwestern researchers are working with have always been there. They were just not “managed” and manipulated like this new material does. This type of thinking leads to alternatives – some work and some don’t – but at least its better than just trying to achieve what you might have done before with reduced resources due to changes in technology, tastes and economics. The “particles” of companies certainly are in place, it’s a matter of how we choose to manage them. Looking at the opportunities for growth in the future may just be the key to surviving any business environment shifts in the now.